In the novel The Two Towers by J.R.R. Tolkien, Treebeard claims that “Saruman has a mind of metal and wheels, and he does not care for growing things.” Saruman is intent on acquiring complete power, and he is using man-made creations such as orcs to gain it. In the process, he is destroying Treebeard’s forest for fuel and is corrupting the creatures in his influence such as Wormtongue. Through the forces of nature and those intent on protecting it like the Ents and Elves who fight to bring Saruman’s destruction, Tolkien displays his disdain for technology when it comes at too high a price for the created world. Saruman gains power through deception and man-made creations, but in the end, he is destroyed by the misled faith in his creations. Treebeard comes to the realization that Saruman is doing something unnatural to the orcs: he is changing them for his own selfish purposes. One sees this when Treebeard proclaims, “Brm,hoom! Worse than that he has been doing something to them; something dangerous” (462). With this revelation, Treebeard begins to plan to fight Saruman and his creations. Saruman has dangerously created orcs for his own purposes and is using them to destroy. Treebeard reacts by choosing to fight even though he previously claims to have no side. This is proof that Saruman has been horribly corrupted and doing things seen as pure evil in Middle Earth. Saruman’s downfall comes when he puts his faith in his creations such as orcs and fortresses as can be seen when Gandalf begs him to come from his tower. This misled faith is highlighted when Gandalf points out Saruman’s fears saying, “Isengard has proved less strong than your hope and fancy would have made it. So many other things in which you’ve put your hope and trust” (568). Because of Saruman’s haughty beliefs that he alone can control all using his own creations, he is brought horribly low when he is trapped in his own tower because he proudly overlooks the possibility of failure. Middle Earth loses its white wizard when Saruman is denied the rights of a wizard as his staff is snapped by Gandalf. This is brought upon him when he turns away from the protection of the wizard law and is corrupted by his search for his power through that which is man-made. Saruman’s fall actually happens when he leaves behind Saruman the White and replaces him with his schemes of power through technology. He ignores the dangers of technology, and in the end, they turn out to be pillars of sand. Gandalf reminds Saruman that he still has a chance to turn away when Saruman refuses and Gandalf warns him that he is “choosing to stay and gnaw on old plots” (568). Saruman is left unstable, grasping at impossible plans after being stripped of a power he never really controlled. In this way his own plots destroy Saruman. The Lord of the Rings is filled with dangerous creations besides the orcs. Two major ones are the One Ring created by Sauron and the Palantír. Gandalf repeatedly states that the Palantír is dangerous. All through pages 580-581, it calls to Pippin and causes him to look into it enabling Sauron to questions him without actually being physically present. Afterward, Gandalf says that pulling away from the power would have been difficult for him if he had looked in. All through The Two Towers the dangers of technology that tempt and corrupt which which heroes desperately fight against. Throughout The Two Towers, Tolkien displays his distaste for the creations of man, especially when it becomes a device for gaining power over the natural world which was created by God. In a way, the entire Lord of the Rings saga points to this. It is seen in the temptations through the Ring and in the pure evil of the Orcs. 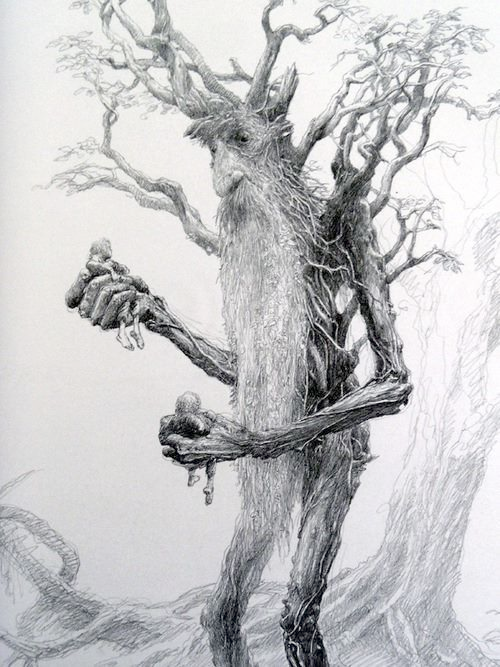 Treebeard, in Tolkien’s words, calls man’s inventions “black evil” (462) and proclaims that when combining man’s creation and twisting God’s it is then black evil. Tolkien does not directly put the almighty God in his books, but he treats humans with the respect that comes from being made in the image of God; furthermore, he shows the evil in the corruption of God’s creation. The Lord of the Rings points to the temptation of corrupted power through the One Ring. Sauron’s ring is built to corrupt, tempt, and give corrupted power; Tolkien shows the weight of temptation that comes when people try to rule their own world through the Ring. This is seen as a physical weight as Sam puts the ring around his neck and “his head was bowed to the ground” (716). When man attempts to make himself king instead of God, the world collapses. This is seen in Sauroman’s fall and in Tolkien’s worldview.